Huddersfield Giants ended a run of three successive defeats by beating Catalans Dragons. Giants led 22-8 at the break with two tries from Aaron Murphy added to scores from Ukuma Ta'ai and Leroy Cudjoe establishing a lead. Scott Dureau's try and penalty goal was the Dragons reply, and they scored again after half time when Julian Bousquet forced his way over. Tries from Ta'ai, Jermaine McGillvary and Scott Grix sealed victory. Catalans have only won once away from Perpignan this season, against Wakefield, and their frustrations led to the sin-binning of Willie Tonga when he went head-to-head with Cudjoe. Giants head coach Paul Anderson had called for a sharper attack from his side, to back up the tightest defence in the league, and he got that with a seven-try display. After a closely contested opening quarter of an hour, Giants made a breakthrough on the back of a penalty when smart work on the left edge put Murphy in. The lead was soon pegged back by Dureau's try, created by Elliott Whitehead's burst, and then the Australian half-back added a penalty goal to put the visitors ahead. After that it was one-way traffic, with Danny Brough kicks leading to tries from Ta'ai, Murphy again and Cudjoe to establish a 14-point half-time lead. Bousquet showed strength close to the line on the back of a penalty to reduce the arrears but normal service was resumed when McGillvary crossed on the right after slick hands. Tonga's dismissal brought the Dragons down to 12 and Huddersfield went in through Ta'ai close to the posts. They then targeted the depleted left edge to score through Grix's scything run and collect the two points. "We created a lot more chances than we've done in a long time. The next challenge is to take those opportunities," the Huddersfield coach said. "We still scored 38 points but it's a little disappointing in that we should've had more. "There were opportunities there that with some more composure we could've seriously run away with the score." "Playing with 12 men cost us. Willie is a competitor, but he shouldn't do things like that. (On injured players): "I hope we get them back soon. "Todd Carney is particularly frustrated. He's been our on and off-field leader since November and we built all pre-season around him." 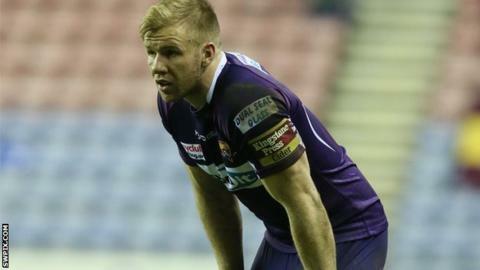 Huddersfield Giants: Grix, McGillvary, Cudjoe, Connor, Murphy, Brough, Wood, Crabtree, Robinson, Huby, Wardle, Hughes, Bailey. Replacements: Kopczak, Ta'ai, Ellis, Cox. Catalans Dragons: Robin, Oldfield, Tonga, Taia, Cardace, Bosc, Dureau, Elima, Henderson, Casty, Whitehead, Anderson, Baitieri. Replacements: Lima, Pelissier, Garcia, Bousquet.